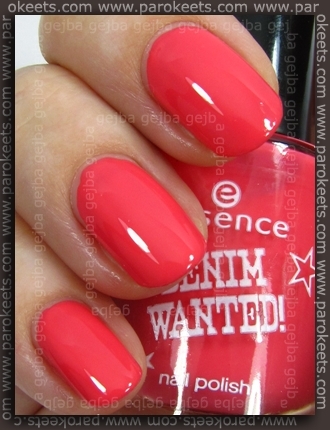 Essence Denim Wanted! polishes are finally mine. And since the luck would have it, I found almost intact stand … and bought all five polishes. 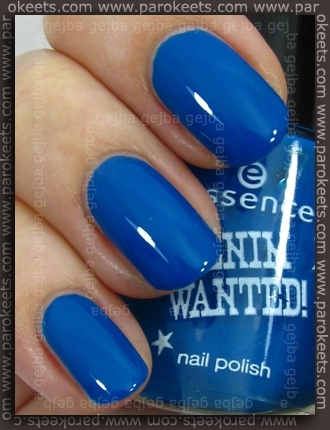 I’ve been anxious to get my hand on blue shades for months now and if I missed them … it would be the end of the world. OK – maybe not that, but close enough. My boyfriend probably thought I lost my mind after I started jumping up and down when I saw Denim Wanted! stand. Enough chatter, let’s take a look at polishes. The same tip Maestra gave you about gray shade application, goes for all the polishes from this TE – brush must be loaded with polish to get problem free application. I used 2 layers + top coat in all the photos. The lightest shade is called High Waist Pink. It’s quite interesting to watch this shade change it’s undertone – it goes from coral, to bubble gum pink and finally light pink. But it is always very wearable pink shade. Gray shade goes by the name Fivepocket Grey. 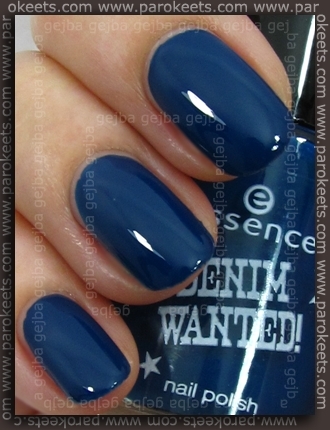 Maestra already showed you this one in her Denim Wanted TE post. I agree with her that there is slightly greenish undertone to this shade. And please ignore the shades seen on the polish. I promise you, the surface is completely smooth as seen on the little finger. Even-though My Boyfriend’s Jeans polish was my favorite after I saw promo pics, Forever Mine almost won the battle after I held them both in my hands. I don’t think I ever saw this perfect cyan and very pigmented to boot. Polish is a bit to blue on the photo. Imagine a little bit of green splash in there. My Boyfriend’s Jeans completely met my expectations. Muted blue with gray undertone. I was intrigued with I Love My Jeans after Goga said that it looks like silver poured in black base. This is the only shimmer polish in this collection. Shimmer is composed of many colors, but silver one prevails. All of the polishes can be used for konading. Here you can see the konadicure I did with I Love My Jeans + fauxnad IP H7 over Fivepocket Grey shade. I found out that you need light speed to transfer image if made with Essie MAY top coat, but supersonic is enough for z Essence Matte Top Coat. And I just barely reach supersonic speed. Price for 9ml bottle is 1,99 EUR. Now quickly – tell me which one is your favorite and if you already own any of these shades. In seveda so stojalca v Müllerju popolnoma izropana. En rožnat lak in en črn eyeliner pa dve zapestnici so še bili tam … ostalo vse long gone. :bljak: (hehe, posrečen smajli, nekako takole sem hotela narest pred Essence stojalom danes) Če ga DM ne bo imel se v naslabšem primeru lahko počaka seveda na Leclerc, oni zmeraj zeeeeeeeeeeelo zamujajo s temi kolekcijami, dobijo pa jih. The grey one is my fave, very classy ! Forever mine me najbolj prepriča. Čeprav imam tudi jaz smolo s praznimi stojali, kar me zdaj ko vidim te lepe swatche še posebno jezi. O.M.G.!! The last two pics…so pretty!! I like the polishes and all but I LOVE what you did with konad! I don’t have any of these yet but will keep my eyes peeled for the gray and dark blue one. Great post! haha, ti je srce na mjestu? i kod nas je došlo! nabavila sam nadlake (zadnja 2 su moja)! a od ove kolekcije je do lakova samo Fivepocket Grey ostao! i naravno oba gel linera su moja! He, he, he – kako da je pao shrek? I want them all! Especially the gray one, I really need a new gray. And the matte top coat. Bi lahko naredili primerjavo črnega lakca iz te kolekcije (I Love My Jeans) in črnega iz kolekcije Moonlight? Če se prav spomnim, je bil tisti poln srebrnih bleščic. Najlepši: My Boyfriend’s Jeans, čeprav so mi tudi ostali prelepi (razen I Love My Jeans). Jaz upam, da jo bodo imeli tudi DMi. Ojoj, eden od modrih bo moral biti moj, ne vem pa še kateri. :D Pomoje temnejši, čeprav tale manikura z mat konadom in svetlejšim modrim je :stars: :drop: ! Res je fantastično, ampak ne vem, kako mi bo uspela, če še Parokeetkam povzroča preglavice. :wink: Žal se moj seznam preveč širi za LE kolekcijo … bom morala celo LJ prešnofat za eyeliner, lak in nadlak. :nervous: :wink: Ta črn pa se mi zdi kot slabša kopija Back to Black od Catrice. Ali pa morda Zoyinega Ravena. V vsakem primeru že videno, tudi v boljši obliki.